What to know: Action-packed and educating, teaching lessons about finding the goodness in people and working together. This action packed series is very educating. The morals taught in the episodes are valuable for the target audience. I love how they are able to teach important lessons in a very entertaining way. The show follows the characters Sonic, his friends and Dr. Eggman. Sonic and his friends always have some conflict with Dr. Eggman. The different schemes that Dr. Eggman comes up with are amusing and I watched till the end to see if Sonic and his friends were be able to solve the problem. Mike Pollock voices Dr. Eggman in a very interesting way. Pollock can sound like a villain in one scene and in another he could be your grandfather. Dr. Eggman is a character with two personalities and it is great that Pollock voices both of them. The characters in this series are unique in their appearance. Sonic and his friends are animals, but they only have a few features that are recognizable as animals. I like that they vary their appearances from other films and series. It keeps the audience interested and intrigued. My favorite part about this series is that they always find a way to make it humorous and add some plot twists. Every episode is different and that makes the audience want to watch the whole series all at once. There are many underlying messages in each episode. The ones that stand out are to find the goodness in people and to work together. Sonic and Dr. Eggman will forever be rivals, but they do enjoy each other's company. Sonic realizes that Dr. Eggman is desperate for attention and uses that to his advantage to be able to get to the good side of Dr. Eggman. This is how Sonic is always able to calm Dr. Eggman down and stop him from continuing his crazy, sometimes evil, ideas - for a while. Sonic and his team of superhero friends have to work together to come up with a plan to stop Dr. Eggman. Sometimes, when Sonic leaves, they fight over what to do and who should be the leader. In the end, they resolve their problems and learn the right thing to do for the next time a similar situation arises. I loved how this DVD teaches valuable lessons that are usually overlooked in other children's shows. I give this series 4 out of 5 stars and recommend it for ages 6 to 9. 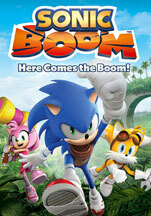 Sonic Boom: Here Comes the Boom is out now on DVDs so check it out! I like this show because it has lots of characters from the classic Sonic Video games and TV shows. It shows their personality and fighting techniques. This is a good introduction to the characters to anyone that wants to play the Sonic games. If you want to try Sonic games, but you don't know any of the characters just watch this show. Sonic Boom - Here Comes the Boom is about Sonic (Roger Craig Smith) and his friends facing challenges usually involving Dr. Eggman (Mike Pollock), where they must work together to either escape a temple or destroy a robot. Sonic can't fight off Dr. Eggman by himself, so he gets help from his friends and sticks the completely wild badger that uses a boomerang as her weapon of choice. Amy Rose is a pink hedgehog who fights with her hammer and keeps everyone at peace. Rounding out the team are Knuckles the echidna with a love of fighting and Tails Sonic's tech-loving fox sidekick that can use his two tails to help him fly around. My favorite episode in this DVD is "Just a Guy." In this episode, Sonic accidently calls someone "just a guy" and everyone gets angry at him. I like this episode because it is funny and has a good message. That message is "don't stereotype people." Another good episode is "CowBot," which is about when Dr. Eggman sends a robot that looks like a cow after Sonic. After a bit of fighting, Sonic gets the CowBot to go after Dr. Eggman. He goes to save him, but the CowBot is incredibly slow so they do loads of funny stuff while they wait. This episode is hilarious in how they solve the problem in the end. My favorite character is CuBot because, whenever his partner OrBot says something smart about something he just says the real meaning without knowing what OrBot wants. For example, in the episode "The Meteor." OrBot says, "Perhaps it is time we bid our foes "adieu." CuBot doesn't know what that means so he just says, "No time, we have to leave," which means the same thing. I find these parts funny. The main message of most of the episodes is, you must work together to complete a challenge. I rate this DVD 3 out of 5 stars and recommend it for ages 4 to 7 because it has good messages in every episode that younger kids will like. It's a Sonic you haven't seen before - an ensemble comedy that pokes fun at action-adventure storytelling, but still manages to deliver plenty of adrenaline! Wherever he goes and whatever he's up against, Sonic is aided by his sidekick, Tails, and his friends Knuckles, Amy, and Sticks and, of course, attacked by his arch nemesis, Dr. Eggman. The series is set in a wide-open world, where most of the characters live in and around an unnamed village. Just over the horizon is a vast landscape filled with beaches, jungles, mountains, undersea civilizations, cloud cities, frozen lakes, and more! Includes 8 Action-Packed Episodes!